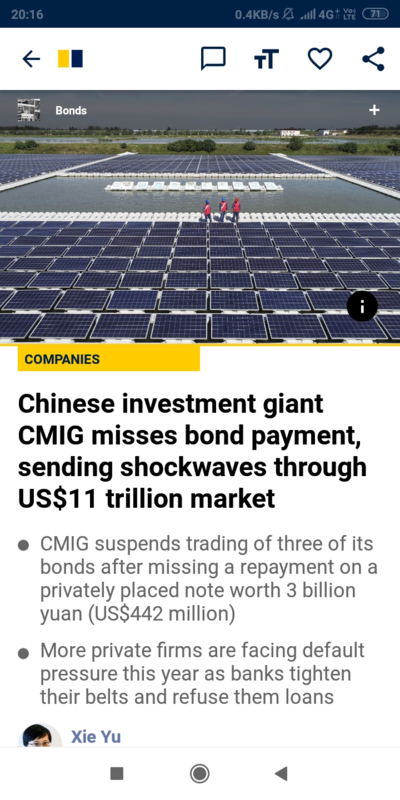 CMIG defaults in bonds ...sending shock waves. China's spreading debt collapse getting bigger by the day. Much smaller than Hyflux's problem! sgbuffett said: China's spreading debt collapse getting bigger by the day. How big is Hyflux's "shock wave"? polanski said: How big is Hyflux's "shock wave"? Tip of the iceberg only.There are trillions of bonds in China queuing up to explode. Small issue lah ... compare with US Fed or US Treasury. US Fed or US Treasiry have been delaying or defaulted their payments to creditors since 2009. Magically selling more US Treasury Bonds in 2018 and 2019 ... Don't know to who leh ??? . QEs = Ownself approved Ownself to add US money supply and later magically USD exchange rate increased ... before repaying and reducing their national debt. So creative ... for their own benefits. Then sent 59 Tomahawk flying missles to Middle East desert. lionkingch55 said: Tip of the iceberg only.There are trillions of bonds in China queuing up to explode. Your eyes are so good? So, Hyflux's is iceberg or tip of iceberg? Current time: 21-4-2019, 4:16 PM Powered By MyBB, © 2002-2019 MyBB Group.